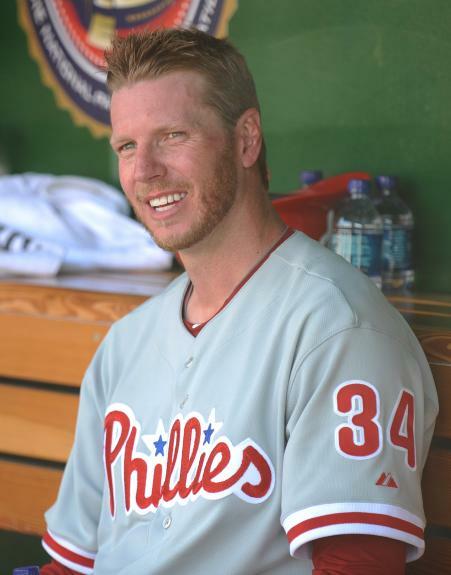 Everyone knew that when the Philadelphia Phillies traded for Roy Halladay that they had something special. They also knew that Halladay was going to pitch some gems. But nothing like Saturday night’s perfect game against the Florida Marlins. It was a 1-0 effort, but not like your normal “perfecto”. Usually, a perfect game (or even a no-hitter) has several signature plays. In 2009, White Sox OF DeWayne Wise protected Mark Buehrle’s gem with a leaping catch at the wall for the final out of the game. And earlier this year, Oakland’s Dallas Braden got big defensive plays from 3B Kevin Kouzmanoff and OF Corey Patterson to help cinch his perfect game. And except for a strong play by Juan Castro knocking down a sharp liner by Jorge Cantu in the 8th Inning, this effort was all Roy Halladay. Here are the numbers from the night… 115 pitches, 72 strikes, at least six “three-ball” counts, 11 strikeouts. All this and the guy makes sure that he does his post-game workout right after tossing the best games of his life. We have always heard about his dedication to his craft. Well, there in lies the best of Roy Halladay and why the Phillies are considered the leader to go back to the World Series for a third straight year. – It was the 20th perfect game in ML history and the second this year, joining Oakland’s Dallas Braden from earlier this season. – It was the second perfect game in Phillies history, joining Jim Bunning in that elite group. Bunning threw a perfect game on June 21, 1964 (Father’s Day) against the N.Y. Mets at Shea Stadium. – Now the Phillies are one of five ML teams to have multiple “perfect games” in franchise history, joining Oakland, Cleveland, Chicago (AL) and the New York Yankees. – This was just the second year in ML history in which we have had multiple perfect games in the same season. The last time it happened was 1880. – With the Phillies and A’s both collecting their second perfect games in franchise history this year, take note that each franchise got their first perfect game in the 1960’s (Bunning in 1964, Oakland’s “Catfish” Hunter in 1968). – Roy Halladay recorded the 19th shutout of his career in the game, one more than Babe Ruth. Watching the Philadelphia TV broadcast, give credit to play-by-play broadcaster Tom McCarthy for handling the event exceptionally. He didn’t believe in the perceived “jinx” about saying “no-hitter” or “perfect game”. Well done T-Mac.